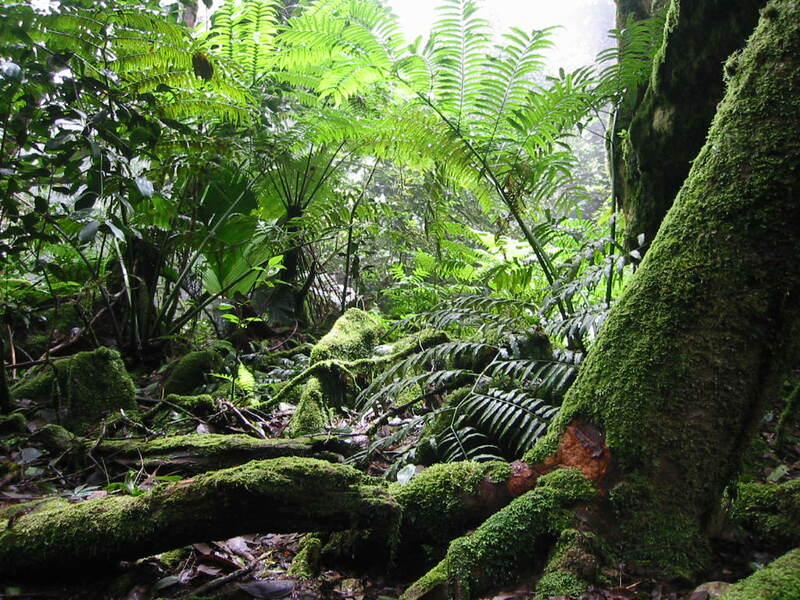 Exciting new fern discoveries in Seychelles! What is amazing with discoveries like these, is that the plants have existed since the time of the first explorers, and locations where they are found have almost certainly been visited by most botanists, and yet these species had never been noted. Maybe not surprising for tiny species such as 'Fouzer kati' – but for large species like the new species of 'Baton monsenyer', which have fronds that are 2-3 metres long….? We still have much to learn! And good observation always helps! 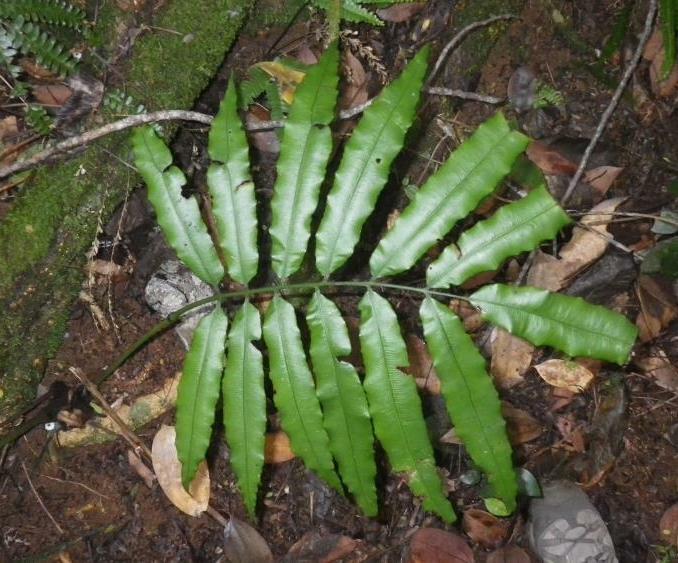 This miniscule species of fern was first noted in 2010 but only described after several years of research during which more specimens were collected. It is named after a local conservationist, Katy Beaver. It grows in wet ravines between 200 and 500m altitude, and forms a mat of tiny leaves on small rocks, so it is difficult to spot. The leaves are only 4mm long and easy to confuse with some species of liverworts and bryophytes (Photo 1). To confirm the identification, you need to check individual leaves, searching for some fertile ones bearing the fructifications (spore-producing bodies) that should be like a small cup situated at the tip of the leaves (Photo 2). Another species of Didymoglossum often grows near or with Fouzer kati (D. cuspidatum) but differs in having larger leaves and the cup-shaped fructification is at the tip of the leaf, immersed in the blade rather than emerging out of it (Photo 3). Reference: Senterre, B., Rouhan, G., Morel, C. & Dubuisson, J.-Y. (2017) New species and records in the fern genus Didymoglossum for the flora of Seychelles, with notes on the Southeast Asian D. motleyi complex (Hymenophyllaceae). Phytotaxa 292 (3): 201–217. Photo 3. Another species (Didymoglossum cuspidatum), is distinguished from D. beaverianum by having fructifications within the tip of the leaf blade. 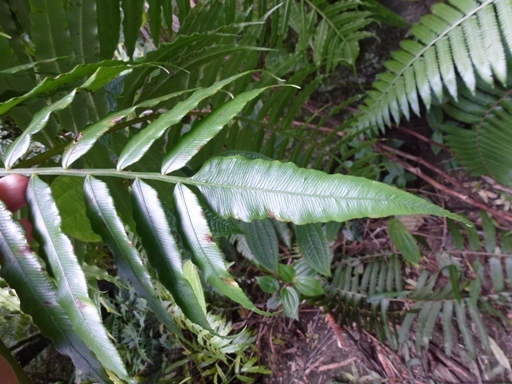 Many Seychellois are familiar with a large fern locally named ‘Baton monsenyer’ (Angiopteris madagascariensis) commonly growing in the moist mountain forests of the granite islands of Mahé and Silhouette. 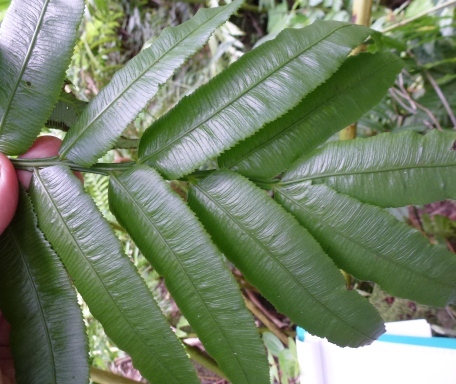 In 2014, two new species of ‘Baton monsenyer’ were added to the fern flora of Seychelles. Both of them are much rarer and so far have only been found in remote mountain forests of Mahé Island. One of them is Angiopteris chongsengiana, named in honour of a well-known Seychellois botanist, Lindsay Chong-Seng. Its Creole name is ‘Baton monsenyer-d-gran bwa’. The other is a rediscovery of a species that was recorded over 100 years ago. It had not been found again and was thought to be a mistaken record - until 2011, when, like the previous species, it was discovered during explorations for PCA’s Herbarium Project. It also belongs to the Marattiaceae family and was previously thought to be Ptisana fraxinea, a species described from Mauritius and supposed to occur throughout tropical Africa. But there are significant differences from the Mauritian plant. The Seychelles plant has been described under the name Ptisana laboudalloniana, thereby honouring Victorin Laboudallon, another well-known Seychellois conservationist. As this species is a bit smaller, it is called ‘Pti baton monsenyer’ in Creole. Genetic analysis of the various species of Ptisana was a key input for the revision of this genus for Africa and neighbouring islands. The number of species recognized in the region is now about 9. The closest relative of Ptisana laboudalloniana appears to be a species found on Ascension Island in the Atlantic Ocean (!). Reference: Senterre, B., Rouhan, G., Fabre, I., Morel, C. & Christenhusz, M.J.M. (2014) Revision of the fern family Marattiaceae in the Seychelles with two new species and a discussion of the African Ptisana fraxinea complex. Phytotaxa 158 (1): 57-75.